In an unprecedented move, the Spotted Trotter’s Kevin Ouzts has accepted a position as executive chef at Barleygarden Kitchen and Craft Bar, opening in April at Avalon in Alpharetta. The chef recently closed the Cockentrice at Krog Street Market so he could focus on the Spotted Trotter. However, Ouzts says his latest project falls in line with that goal, as he’ll be using Spotted Trotter products in the kitchen at Barleygarden. Created by Hop City founder Kraig Torres, Barleygarden will offer lunch and dinner daily, serving all ages indoors and possibly only those 21 and up at the open-air rooftop bar. There will also be a beer garden outside and a to-go window. Since Avalon is an open-container community, Ouzts is designing the Barleygarden menu with portability and pairings in mind. There will be seasonal salads, a roasted pork sandwich with pickled broccolini and melted provolone, a bratburger, corn and onion fritters, handcut fries, and sausages like the Spotted Trotter’s chicken cheddarwurst. Prices range from about $3 to $16. Although Ouzts won’t be cooking at Barleygarden, he will be there a few days a week, overseeing the line cooks. The rest of the time, he’ll focus on making the Spotted Trotter into Atlanta’s flagship brand with a new manufacturing facility and store, coming in 2018. 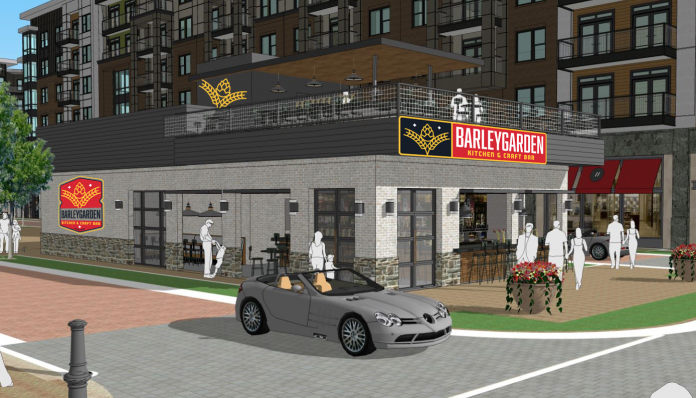 Similar to Hop City’s Krog Street Market location, Barleygarden’s bar menu will focus on beer with a rotating 66-tap list downstairs and an additional 32 taps focused on European brews upstairs. The cocktail menu will change six times a year, and six to ten wines by the glass will be available, too. Expect blueberry-ginger sangria and a riff on the sidecar.